Our vets do a lot for local rescue groups and there are a couple of cats currently in residence in the cat tower in the waiting room. Love Bug made a bee-line for them so I sat down next to her. 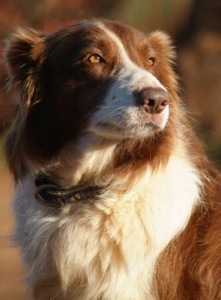 A divine brown border collie nudged my shoulder, leaned in for a cuddle then plonked on my lap. Not this one, but one who looked a whole lot like it. Never one to pass up some collie any kind of dog love, I sat for a few minutes and cuddled my new friend. This wasn’t enough apparently because as soon as I stood at the vet counter, my friend jumped up on his hind legs, front paws on my arm. More loves?